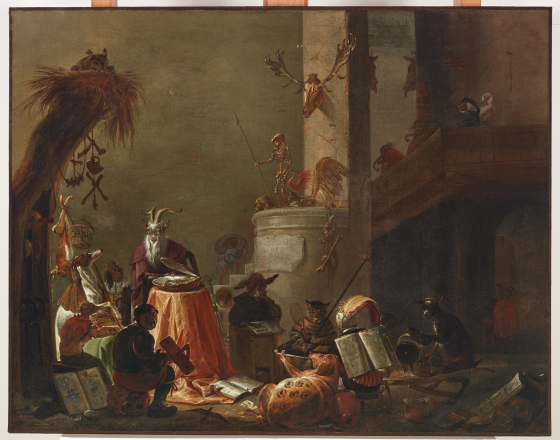 Cornelis Saftleven's richly detailed painting offers a humorous critique of academic pursuits. A donkey appears to fall asleep while reading a book, while a pig lying on the ground is preoccupied with smoking rather than intellectual discussion. Objects such as the playing cards strewn across the ground also hint at idleness rather than scholarly productivity. 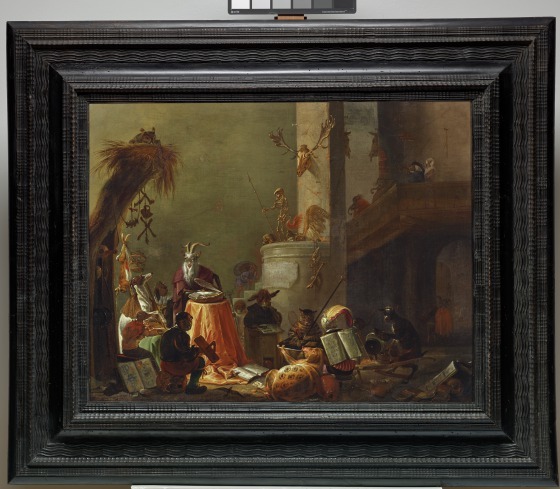 Animal satires were popular in the 17-century Dutch Republic, but Saftleven's painting is unusual in that it contains imagery associated with other genres, including witchcraft scenes. 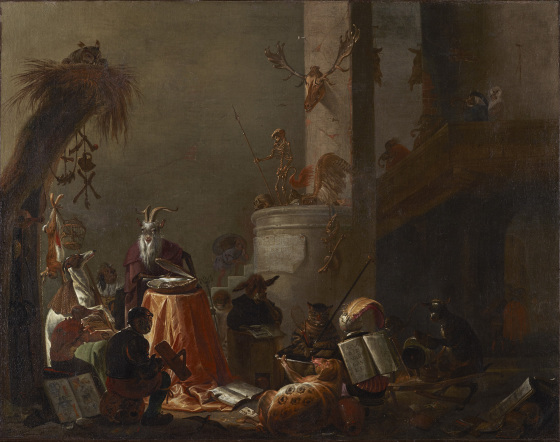 These potentially diabolical aspects include bones suspended from the tree trunk and hybridized animals such as the anthropomorphic owl seated on a skull. 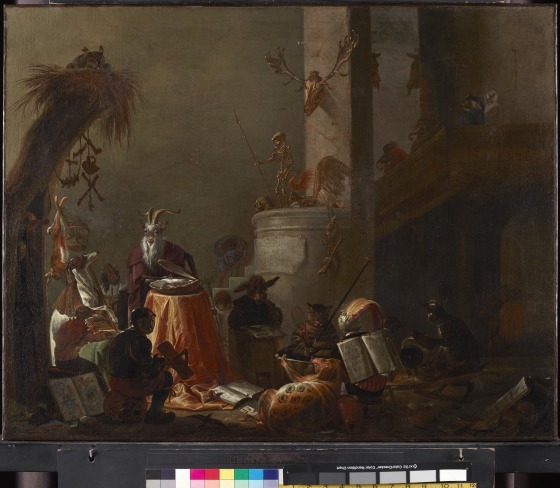 The scene may also reference contemporary literature or political events, as Saftleven executed at least one animal satire painting based on a political play from the period. Such varied sources suggest that College of Animals conveyed symbolic significance to 17th-century audiences, but these potential meanings remain unknown today, endowing the scene with ambiguity. 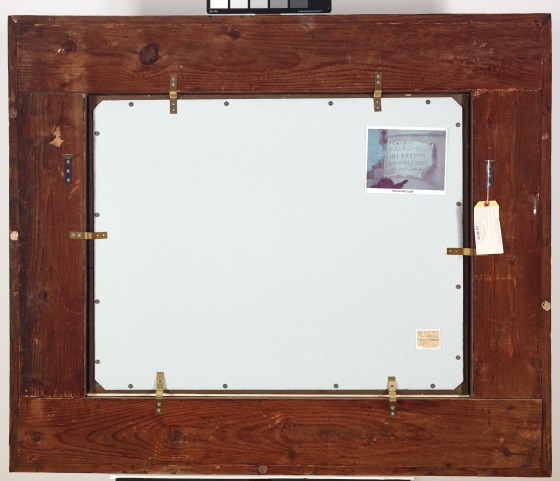 Bonnie Pitman, ed., "College of Animals," in Dallas Museum of Art: A Guide to the Collection (New Haven, CT: Yale University Press, 2012), 155. Cornelis Saftleven is satirizing a wide range of intellectual pursuits and affectations common in his time: the tedious discussions of academic clubs, the mania for curio collecting, and the infatuation with romantic poems about knighthood. Next to the smoking pig is a copy of Amadis de Guale, a very popular tale of a medieval knight. View an engraving of the artist by Lucas Vorsterman after Anthony van Dyck. 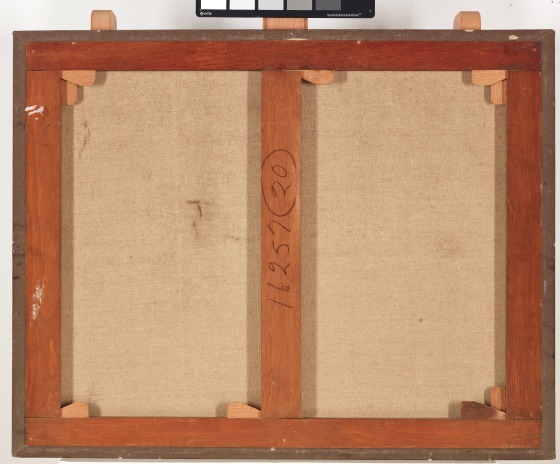 Read a biography of the artist from the Getty. 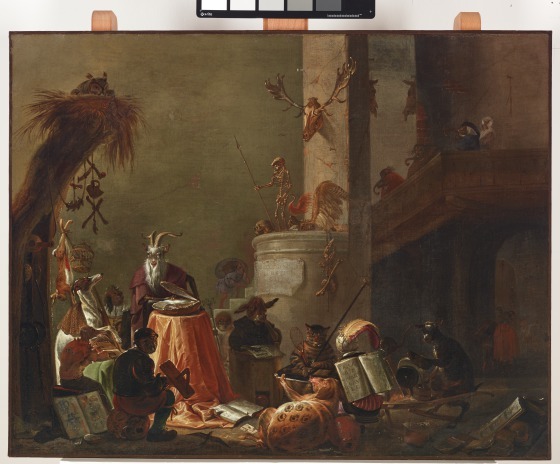 Check out another satirical animal painting by Saftleven titled Satire on the trial of Johan van Oldenbarneveldt, 1663.